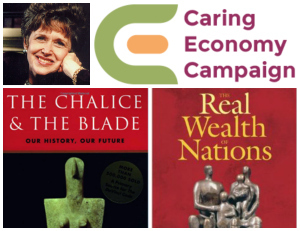 In her book, The Chalice & The Blade, noted author, social scientist and member of the World Future Council, Dr. Riane Eisler led us on a journey exploring 30,000 years of human history. What she discovered was a revolutionary perspective on human relationships. Her book presents a radical, fresh understanding of the origins of human culture and introduces her inspiring Cultural Transformation Theory. Dr. Eisler offers “a way of living and making a living that is more equitable, peaceful, sustainable, and fulfilling” by sharing anthropological evidence that demonstrates the role partnership has played in the development of civilization and will continue to play in the future of our world. Over the years, Riane has expanded and deepened her work by establishing the Center for Partnership Studies, uncovered the truth of the Real Wealth of Nations, and, has launched the Caring Economy Campaign. It may seem unlikely that a partnership approach to business, government and society will be successful in this ‘dog eat dog’ world that we’ve been convinced we inhabit. Words like caring, kindness and cooperation may invoke images of flower children holding hands and singing Kumbaya. Contemplating a partnership approach to the competitive world of business may seem naive and foolhardy. Surprisingly, employing partnership principles results in greater well being – personally, professionally and socially. In The Real Wealth of Nations and with the Caring Economy Campaign’s Social Wealth Economic Indicators, Dr. Eisler provides solid proof of the dollars and sense 😉 of partnership. Storytelling has long been recognized as the central medium within which cultural information is shared and preserved. Folktales are mirrors reflecting deeply held, shared human values. In addition to Dr. Eisler’s work, evidence for our inherent tendency toward partnership and away from dominator relationships is found in folklore from many cultures. Combining Riane’s scientific work with these reservoirs of human wisdom enables us to understand, with both heart and mind, the critical role a partnership-based culture plays. As we navigate our current personal and global challenges, having an awareness of Partnership Cultural Principles is essential. We have begun to rediscover what our ancestors knew – we are in this together. Crafting a meaningful, collaborative approach within ourselves and towards one another is the solution we are all looking for. Our challenge is to create it on a global scale by beginning right where we are. There are 2 opportunities coming up to experience the power of partnership firsthand. Her talk is titled: “What Is Good for Women Is Good for the World.” The Symposium is offering a Holiday Special – order your ticket before December 31 and save $26. Just choose Option 4 or 5 to receive this limited-time price. Storyteller & writer, Zette Harbour draws upon folklore and the science of partnership, as developed by Dr. Riane Eisler. This 2-hour class is designed to create greater understanding of partnership principles and empower participants to incorporate this into personal, professional and cultural settings. Register at Cuesta College Community Programs.